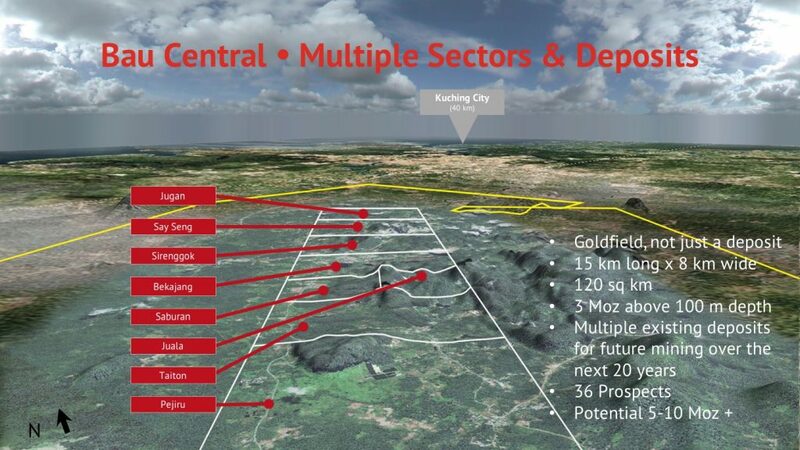 The Bau Goldfield in East Malaysia is a world-class gold project with a century long history of successful gold mining. Itinerant Chinese miners first began working the area in the 1800s, and modern techniques made it production-worthy again with the rising price of gold in the 1970s. When the value of gold went the other direction in the ’90s, mining operations at Bau Goldfield ended. Geologically similar to the Carlin Trend in Nevada, the property has multiple deposits and an established (JORC/NI 43-101) gold resource. To date, it’s estimated that more than 3 million ounces of gold have been mined at Bau. Yet previous operations never exceeded 60 meters below surface, and no exploration or mining has been done at depth. Airborne DIGHEM and magnetic data sets show multiple resistive and conductive anomalies below the surface, and suggest that comparisons between Bau Goldfield and the Carlin Trend in Nevada are justified. Besra holds an 85.61% controlling interest in Bau Goldfield, with an agreement to increase ownership to 93.55% by September 2015. A feasibility study was released early in 2014 and we are preparing for the next phase of development at this “company maker” project. The Bau property is a brown-field project, spread over a large geographic area in which Besra is in a consortium with a Malaysian company with material Bumiputra interest that owns rights to mining tenements covering much of the historic Goldfield.